The idea of a weblog, or "blog" in the current lexicon is to report, opine, rant, predict, question, or stream consciousness. It is generally one person on a keyboard entering items into cyberspace and beyond. It is generally accountable to nobody and thus an apology for misrepresentation is rarely required. 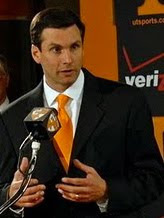 Today I feel compelled to apologize to Tennessee Head Football Coach Derek Dooley. In yesterday's entry, I made an off-hand remark, reflecting on the transgressions of a couple of knuckleheads from the football team. I wrote quite sarcastically "And I thought the new boss was nothing like the old boss." Well my first instincts were correct. Yesterday Coach Dooley dismissed Sophomore Safety Darren Myles Jr. from the program, and suspended two other players indefinitely. Dooley's words back up his actions, maintaining that being a member of the University of Tennessee football squad is "a privilege, not a right." "As I have referenced on many occasions, a change in culture is achieved in time through a combination of education, discipline and support. We will aggressively continue to build on the many positive changes that have occurred over the last five months to ensure our program is represented with class and dignity." Remember six months ago when Lane Kiffin bolted for USC after one season, and Tennessee couldn't find a coach? Well they stumbled onto Dooley and the program looks like it's in very strong hands. Meanwhile Kiffin has inherited a mess at USC. Sometimes karma works the way it's supposed to. The new boss is nothing like the old boss. We won't get fooled again.